We have not seen political chaos on this scale since the 1970s. Yet unlike the 1970s, markets continue to bury their heads in the sand, in the mistaken belief that the central banks will always be able to ensure that prices never fall. Even worse is that a generational divide has opened up in both the US and UK, as most assets are owned by older people. Younger people instead find themselves burdened by high levels of student debt, and facing a future where weekly earnings are no longer rising in inflation-adjusted terms. Unsurprisingly, push-back is now developing against these dramatic changes. On COP-21, powerful opponents such as Michael Bloomberg have begun to co-ordinate moves by several key states, cities and companies to instead “do everything that America would have done if it stayed committed” to the Agreement. Trump’s other major policy move – the lifting of restrictions on the development of fossil fuels – is also seeing push-back, this time from the markets. Oil prices are already back to pre-election levels, and are likely to go much lower as new US production comes online. Trump’s position is also weakened by his failure to recruit a large team of highly skilled people, capable of promoting his agenda with all the relevant stakeholders. So far, he has only nominated 83 people to fill the 558 key positions in his Administration that require Senate confirmation. In the Dept of Commerce, only 7 of the 21 key positions have been nominated; in Energy, only 3 out of 22; in Treasury, only 10 out of 28. As a result, the US now seems likely to face political stalemate. Trump clearly has a mandate to push through his changes. But every day that passes makes it less likely that his key policy objectives – healthcare/tax reform and infrastructure spending – can be implemented. The problem is simple – every new President has only a short “window of opportunity” to implement his policies, as their post-election momentum soon starts to disappear. By Labor Day (4 September), legislators are refocusing on next year’s mid-term elections. Their ability to make the compromises necessary for major legislation soon disappears, once the “losers” from any change make their voices heard. The breakdown duly occurred with May’s decision to adopt a “hard Brexit”. May, like Trump, relied on a small group of advisers and failed to recruit the team needed to push through her ambitious agenda of total EU withdrawal. The result, as I noted last month, was that the “UK risked crashing out of EU after election without a trade deal“. This stance created fertile ground for Corbyn as he mobilised large numbers of young people to vote for the first time. They quickly realised that their future was at stake, given that the Brexit negotiations are due to start on June 19. May will clearly try to hang on – but she is unlikely to succeed for very long. Corbyn’s move to propose giving EU citizens full rights after Brexit could easily be the straw that brings May down, as leading Tories such as Ken Clarke and others would no doubt vote with him. As in the US, political stalemate is likely to develop. Brexiteers no longer have a mandate for a “hard Brexit”, where the UK would leave the EU without access to the Single Market and Customs Union. But neither can Remainers easily reverse the formal EU exit process, which will see the UK leave the EU by March 2019. Yesterday, senior EU negotiators warned that “the chances of Britain crashing out of the EU without a new (trade) deal were now “over 50%””. Clearly, therefore, the UK’s preparations are not going well. Instead of building trust, the UK’s Brexit Secretary, David Davis, seems to think that threats – such as promising “the row of the summer” – are the best way to open discussions. I have taken part in major trade and contract negotiations around the world. Based on this experience, I believe his strategy is very unlikely to succeed. It risks instead leading to a populist-style “Battle with Brussels”, which the UK will lose. The UK will then crash out of the EU – with no deal on trade – long before the March 2019 deadline. “The chip is bought by a company in Germany. The metals inside it are sourced from South Africa and Turkey, using free trade agreements the UK has through its EU membership. Some of the plastics inside it are processed in Poland and Spain. Engineers from France, Croatia and Hungary worked alongside Brits in Cardiff to design it. When finished, it is packaged by a worker from Bangor, Wales and delivered to the port by a driver from Slovakia. “The chip has been made to European standards, its design protected by a Europewide trademark. It was insured with a financial package covered by EU passporting and, when incorporated into a machine and put in the shop, it will meet Europewide levels of consumer protection. A hard Brexit, without access to the Single Market or Customs Union, will not just impact the UK. 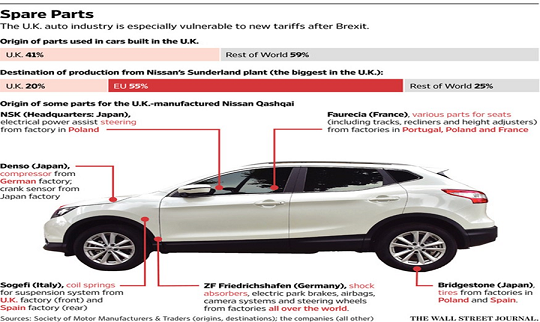 As the CBI example confirms, today’s complex and extended supply chains mean that companies across the EU27, and around the world, will find their trade disrupted. Many in the UK chemicals industry – the UK’s largest manufacturing export earner – are also very worried. Its largest customer, the car industry, is totally dependent on global supply chains and just-in-time delivery, as the chart shows. Going back to a pre-Single Market world of tariffs, customs barriers, endless form-filling and border delays will lead to major uncertainty and loss of business. But it is very hard to see how this can happen with Brexit, as EU Commission President Juncker warned last month. I am therefore not optimistic about the outcome of the talks. I correctly warned – over a year ago – that Brexit was likely. Having followed developments since then, I find it hard to believe the EU 27 will allow May a back-door re-entry via a new Protocol 36-type deal, after a “hard Brexit”. This seems a totally unrealistic objective. I hope I am wrong. But if I am right, the current UK government strategy means there is no “business as usual” option for the vast majority of UK companies – or for many EU 27 and non-European businesses. I fear, as I have warned since March 2016, “Brexit will hit UK, Eurozone and global economies“. The CEOs of the world’s 2 largest investment banks have already warned of difficult times ahead. 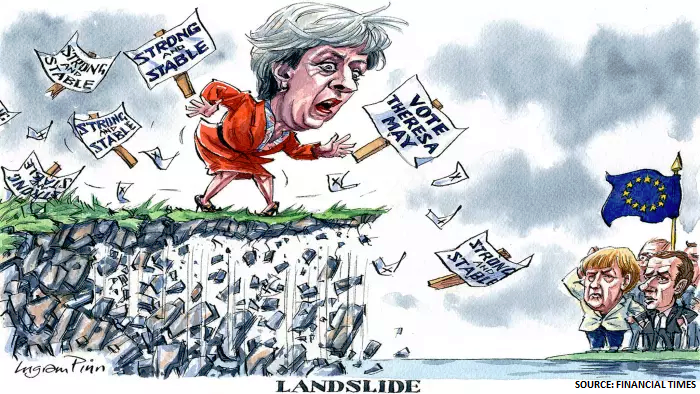 We must all hope that May will use her potential landslide election win to quickly reverse her recent rhetoric, and return to the common sense positions she staked out before the Referendum. It is not too late for her to agree to remain in the Single Market, the Customs Union and accept the jurisdiction of the European Court of Justice. 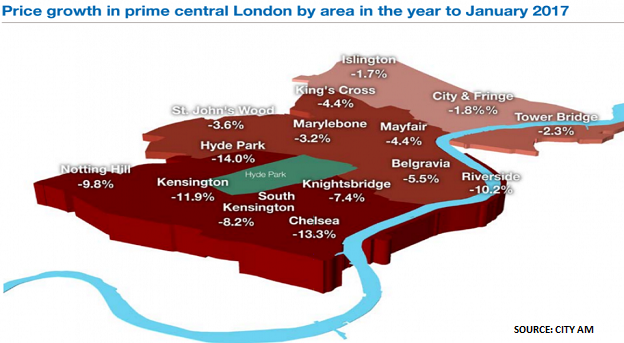 Without such a move, London home owners will face a perfect storm as the financial services industry “de-clusters” to Frankfurt, Paris, Brussels, Dublin and Amsterdam next year.